One embodiment of the present invention provides a distributed computer system comprising a group of nodes, said group of nodes having a first and a second node adapted to act as current monitor nodes, each node of the group of nodes having an identifier and a management layer being informed which node currently acts as the current monitor node. The first and second node each include a protocol server adapted to associate and to send an address to a node requesting an address in the group of nodes, and a memory adapted to store an association address-identifier of a node requesting an address. The protocol server is further capable of requesting the management layer of a node for an indication informing if said node acts as the current monitor node, and attributing, to the current monitor node, the ownership of a list of associations, said list comprising associations of the memory. Other alternative features and advantages of the invention will appear in the detailed description below and in the appended drawings. FIG. 9 is a flow-chart of the address synchronization according to an embodiment of the invention. 7-10 is a network interface device connected to a communication medium 8, itself in communication with other computers such as computer system 11. Network interface device 7-10 may be an Ethernet device, a serial line device, or an ATM device, inter alia. Medium 8 may be based on wire cables, fiber optics, or radio-communications, for example. 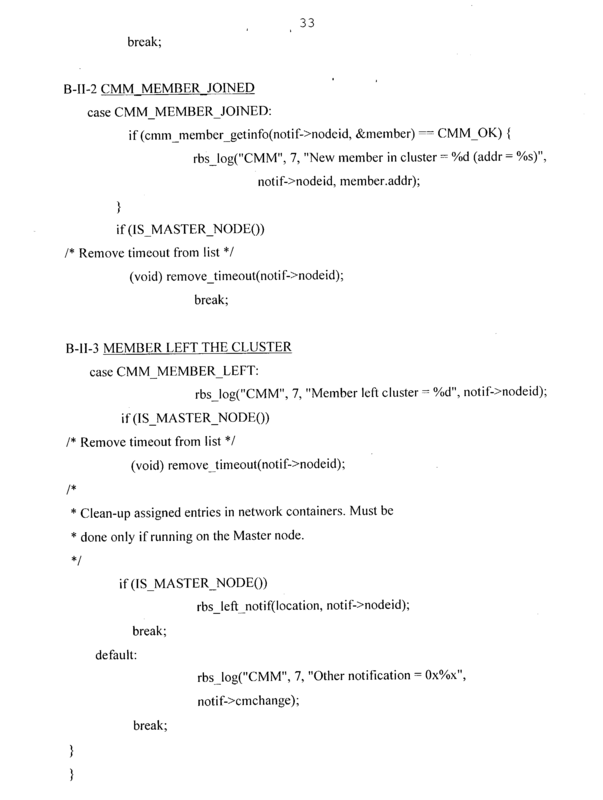 The computer system  10 may be a node amongst a group of nodes in a distributed computer system. The other node 11 shown in FIG. 1 comprises the same components as node 10, the components being designated with the suffix 11. The node 11 further comprises a mass memory 4-11, e.g. one or more hard disks. Thus, node  10 is considered as a diskless node and node 11 is considered as a diskfull node. Data may be exchanged between the components of FIG. 1 through a bus system  9-10, respectively 9-11, schematically shown as a single bus for simplification of the drawing. As is known, bus systems may often include a processor bus, e.g. of the PCI type, connected via appropriate bridges to e.g. an ISA bus and/or an SCSI bus. In FIG. 2, each node Ni of cluster K is connected to a first network  31 via links L1-i. This network 31 is adapted to interconnect this node Ni with another node Nj through the link L1-j. If desired, the Ethernet link is also redundant: each node Ni of cluster K is connected to a second network 32 via links L2-i. This network 32 is adapted to interconnect this node Ni with another node Nj through the link L2-j. For example, if node N2 sends a packet to node Nn, the packet may be therefore duplicated to be sent on both networks. The mechanism of redundant network will be explained hereinafter. In fact, the foregoing description assumes that the second network for a node may be used in parallel with the first network. In a more detailed exemplary embodiment and according to the Internet Protocol, a packet having an IP header comprises identification data as the source and destination fields, e.g. according to RFC-791. The source and destination fields are the IP address of the sending node and the IP address of the receiving node. It will be seen that a node has several IP addresses, for its various network interfaces. Although other choices are possible, it is assumed that the IP address of a node (in the source or destination field) is the address of its IP interface  100 (to be described). FIG. 3 shows an exemplary node Ni, in which the invention may be applied. Node Ni comprises, from top to bottom, applications  13, management layer 11, network protocol stack 10, and Link level interfaces 12 and 14, respectively connected to network links 31 and 32. Applications 13 and management layer 11 can be implemented, for example, in software executed by the node's CPU 1. Network protocol stack 10 and link level interfaces 12 and 14 can likewise be implemented in software and/or in dedicated hardware such as the node's network hardware interface 7. Node Ni may be part of a local or global network; in the foregoing exemplary description, the network is an Ethernet network, by way of example only. It is assumed that each node may be uniquely defined by a portion of its Ethernet address. Accordingly, as used hereinafter, “IP address” means an address uniquely designating a node in the network being considered (e.g. a cluster), whichever network protocol is being used. Although Ethernet is presently convenient, no restriction to Ethernet is intended. above IP interface  100, message protocol processing functions, e.g. an NFS function 104 and/or a DHCP function 105. This DHCP function is adapted to use the DHCP protocol as described in the RFC 2131, March 1997. Network protocol stack  10 is interconnected with the physical networks through first and second Link level interfaces 12 and 14, respectively. These are in turn connected to first and second network channels 31 and 32, via couplings L1 and L2, respectively, more specifically L1-i and L2-i for the exemplary node Ni. More than two channels may be provided. Link level interface  12 has an Internet address <IP—12> and a link level address <<LL—12>>. Incidentally, the doubled triangular brackets (<<. . . >>) are used only to distinguish link level addresses from global network addresses. Similarly, Link level interface 14 has an Internet address <IP—14>and a link level address <<LL—14>>. In a specific embodiment, where the physical network is Ethernet-based, interfaces 12 and 14 are Ethernet interfaces, and <<LL—12>>and <<LL—14>> are Ethernet addresses. IP functions  102 comprise encapsulating a message coming from upper layers 104 or 105 into a suitable IP packet format, and, conversely, de-encapsulating a received packet before delivering the message it contains to upper layer 104 or 105. In redundant operation, the interconnection between IP layer  102 and Link level interfaces 12 and 14 occurs through multiple data link interface 101. The multiple data link interface 101 also has an IP address <IP—10>, which is the node address in a packet sent from source node Ni. References to Ethernet are exemplary, and other protocols may be used as well, both in stack  10, including multiple data link interface 101, and/or in Link level interfaces 12 and 14. Furthermore, where no redundancy is required, IP layer  102 may directly exchange messages with anyone of interfaces 12,14, thus by-passing multiple data link interface 101. It will be appreciated that layers  10 and 11 comprise components to provide a highly available link with application layer 13 running on the node. The management layer 11 also comprises a management and monitor entity of the node in the cluster, e.g. a Cluster Membership Monitor (CMM). The DHCP multi-layered architecture  116 is composed of a service provider layer 126, a private layer 136 and an application/service provider layer 146. As described in Appendix A-I-1, the service provider layer  126 implements the service provider layer API functions described in Appendix A-I-4, exported by DHCP public modules and consumed by the private layer. 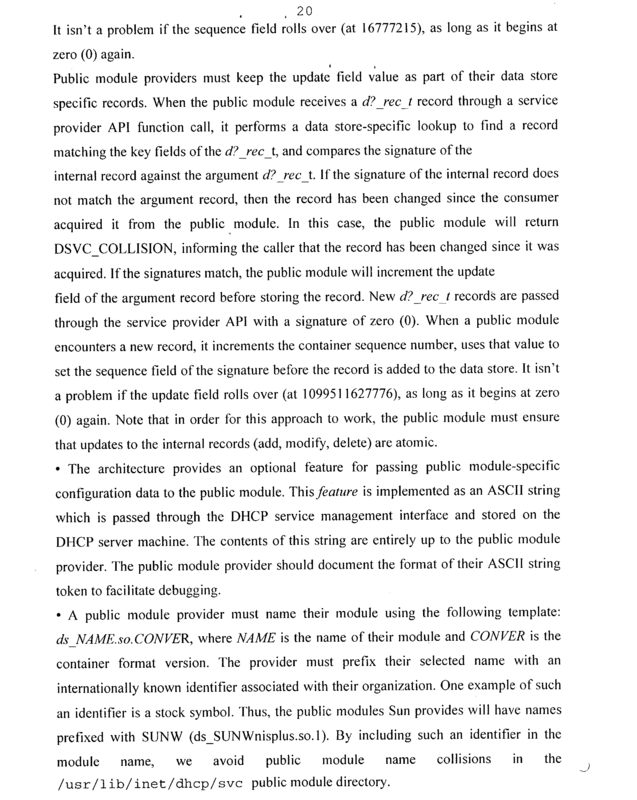 Moreover, in Appendix A-I-2, A-I-3 this service provider layer defines the data structure stored in portions of disk accessible from the DHCP function, these portions of disk may be called “container”. There may be two types of containers called dhcp containers, the dhcptab container and the dhcp network container. The dhcptab container contains DHCP configuration data. There is only one instance of a dhcptab container maintained in the DHCP service. There can be any number of dhcp network containers, e.g. one for each network supported by the DHCP service. dhcp network containers contain records. The private layer  136 implements framework-related functions for locating and loading public modules, and provides “consumers API functions” used by consumers of the DHCP service data. The Application/service provider layer  146 contains all consumers of DHCP service data such as the DHCP server, the administration tools. FIG. 5 illustrates a partial cluster comprising two diskfull nodes. As herein above described, diskless nodes have the same structure as a diskfull node without a memory  4 containing containers 41 and 42 as described hereinafter. Thus, each diskfull node comprises a new DHCP function  106, also called the new DHCP server 106, composed of a core DHCP server 1061, a configuration file tool 1062 and a public module 1063 called e.g. 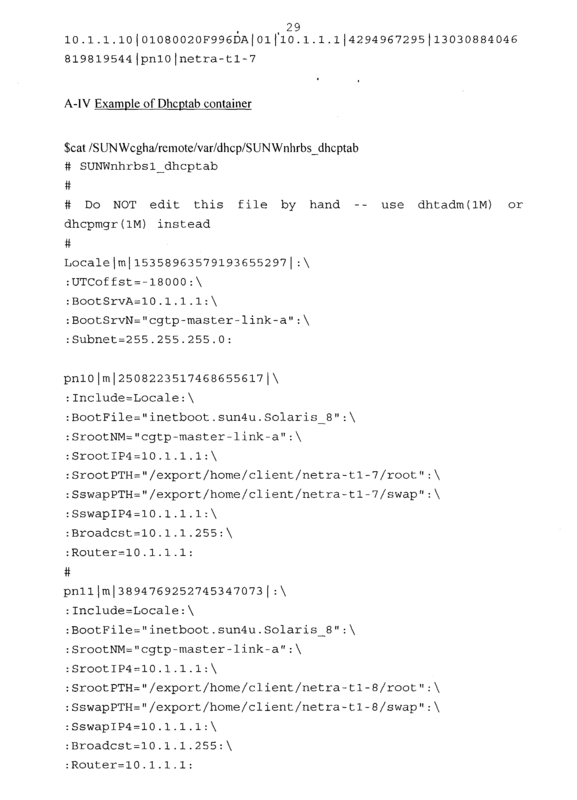 NHRBS public module (Sun Netra Highly Reliable Boot Service). The core DHCP server 1061 corresponds to the known DHCP architecture of FIG. 4. Thus, the configuration file tool 1062 may be part of the Application/Service Provider layer as an administration tool and the public module 1063 may be part of the Service Provider layer. The configuration file tool  1062 is adapted to configure the core DHCP server so as to use the public module 1063. Then, other DHCP administration tools, as this configuration file tool 1062, may also use the NHRBS public module 1063. This configuration file tool 1062 is adapted to generate a main configuration file in which are given the following information e.g. the name of the public module 1063 to use, the path name of the directory containing the various data containers, the network interfaces to monitor. Moreover, this configuration file tool if adapted to set or to modify values in the main configuration file. An example of a main configuration file generated by the configuration file tool is in Appendix A-II. 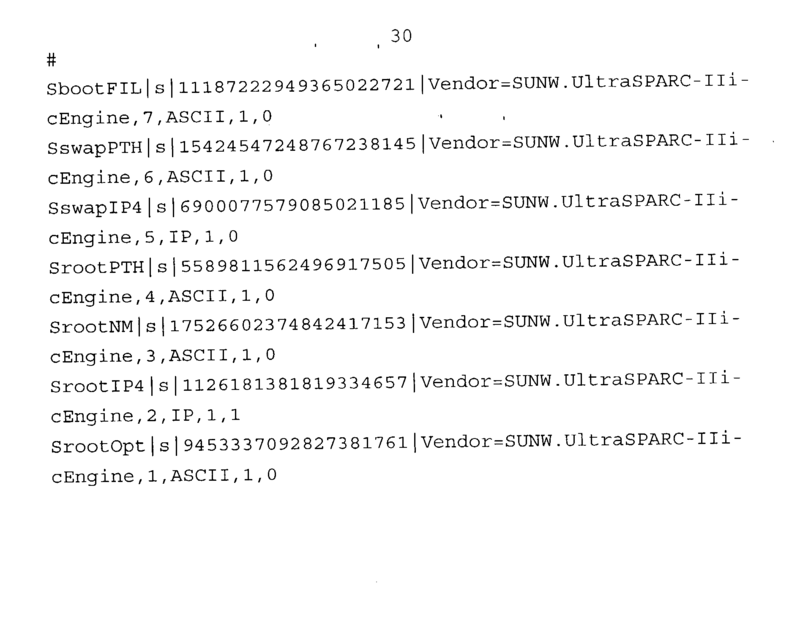 In this example, the main configuration file containing DHCP service configuration parameters is stored in /etc/inet/dhcpsvc.conf, the RESOURCE line indicates the use of the NHRBS public module called SUNWnhrbs, the path name PATH=/SUNWcgha/remote/var/dhcp indicates the directory containing the various data containers and the INTERFACES line indicates the network interfaces to monitor. The new public module  1063 is a dynamic library automatically loaded at run-time by the core DHCP server 1061. For example, if interface hme0 is connected to sub-net 10.1.1.0 and hme1 to sub-net 10.1.2.0, the network containers will be named: SUNWnhrbs1 —10—1—1—0 and SUNWnhrbs1—10_1 —2—0. The content of the network containers used by SUNWnhrbs may be compatible with the ones used by the public module of the service provider layer. These network containers  41, 42 are used by the new public module 1063 to store data associated in a table T as illustrated in FIG. 6. The content of these network containers  41, 42 may be rendered compatible with the containers used for other modules. The dhcp network container and the dhcptab container are configured by the configuration file tool 1062. An example of dhcp network container configured by the configuration file tool is given in Appendix A-Ill for the sub-network 10 —1—1—0. As described hereinafter, the entry concerning the IP address 10.1.1.10 is manually bound to the node which identifier is 01080020F996DA. 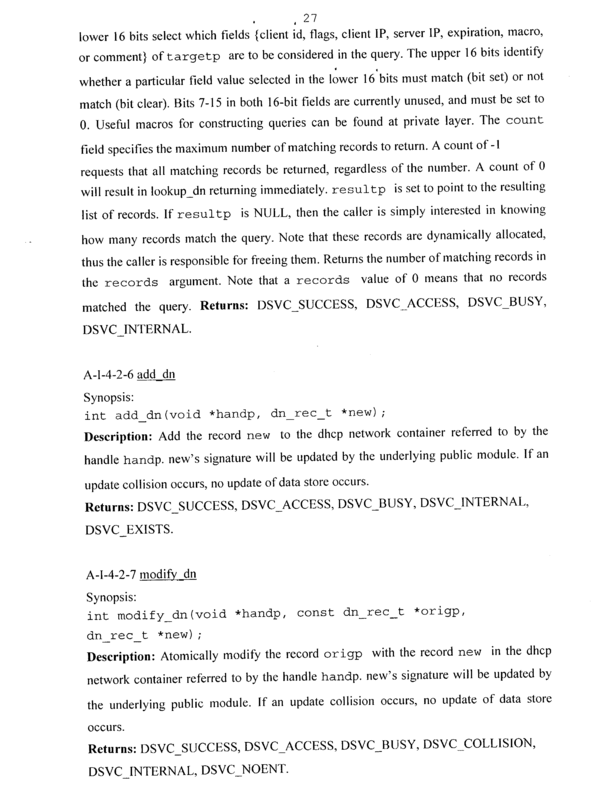 An example of dhcptab container is given in Appendix A-IV. This dhcptab container contains definition for macro's and symbols which can be applied to one or more network container entries. This container is not modified by the configuration file tool 1062 of the invention. Amongst diskfull nodes, the master NM and vice-master NVM nodes of the cluster are to be designated initially and at every boot of the system. Moreover, when the management layer  11-NM detects the master node NM as failed, the vice-master NVM is designated as the new master node of the cluster. The management layer 11-NVM detects the vice-master node as the current master node. The DHCP server of a node is advantageously linked to the management layer of the node. Indeed, at initialization time, the NHRBS public module of each diskfull node creates a thread enabling the new DHCP server to be connected to the management layer services to receive cluster membership notifications (MASTER-ELECTED, MEMBER-JOINED, MEMBER-LEFT). When such a notification is received, the new public module  1063 is adapted to take the appropriate action as described in Appendix B-II and hereinafter in the different methods. A first method of an embodiment of the invention is illustrated in FIG. 7 when a client node boots and requests for an IP address (operation  400). Each diskfull node receives the broadcast request (e.g. DHCP DISCOVER) in its DHCP server (operation  410). Each diskfull node has its,new DHCP server using the new public module to order the management layer to checks the node's role (operation 420). If the current diskfull node is not the current master node (operation 430), then the flow chart ends. If the current diskfull node is the current master node (operation 430), the table of entries may be modified by the new DHCP server using the new public module to indicate the monitorship of the current master node (operation 450). Thus, the new DHCP server using the new public module of the master current node changes the table of entries by setting all the server IP addresses (S-IP) as being the master node IP-address, such as getting the ownership of all the IP addresses configured. In an embodiment, the master node IP-address may be the multiple data link interface address of the master node. Thus, only the new DHCP server of the current master node replies to the broadcast request by providing the administration data comprising the required IP address C-IP to the node requesting an address (operation 460). In Appendix B-II-1, when a MASTER-ELECTED notification is received, the management layer of the node checks the node's role (operation  420). Thus, the table of entries may be modified by the new DHCP server using the new public module to indicate the monitorship of the current master node (operation 450). When a node is detected as a failed node (MEMBER-LEFT) (operation  510), the flag value corresponding to the IP-address of said failed node is checked (operation 520). If said flag designates a “manual” value, the current master node does no action for this node (operation 530). This means a user may change manually, e.g. the hardware board and the corresponding identifier. If said flag does not designate a “manual” value, the current master node clears the node identifier from the table and the flag of said entry (operation 540). This operation liberates the resources in the containers corresponding to this entry. When receiving a request from a client node for an IP address allocation (operation  600) (MEMBER-JOINED), the master node provides an IP address (C-IP) from a first container for a first link level interface of the client node. If the client node accepts the IP address (operation 610), a mechanism is adapted to synchronize the IP address allocation for both containers. Thus, the second container may be bound to provide a given IP address to the second link level interface of the client node. The second address is calculated by changing the third octet to designate the second network. This address has the same hostnumber as in the IP address of the first link level interface and designates a different sub-net than the IP address of the first link level interface. The first and second containers are updated in a synchronous way (operation 620). At operation  600, when a client node requesting an address (for example at or after a reboot time), the master node tries to provide only an IP address (C-IP). The mechanism may use an internal cache of managed IP addresses. This cache is used to keep track of the IP address provided to the client node. Thus, the internal cache may provide the same IP address between several re-boots to a given node. The synchronization mechanism at operation  620 is also used if the node left the cluster for example. The DHCP server (using the NHRBS public module) is responsible for maintaining DHCP network containers coherency. As stated above, when an entry is assigned to a first link of a node (or freed) in one network container, an entry has to be assigned to the second link of the same node (or freed) in the other network container. attributing, to the current monitor node, the ownership of a list of associations, said list comprising associations of the memory of first node shared with associations of the memory of second node. 2. The distributed computer system of claim 1, wherein the protocol server of the current monitor node is adapted to permanently associate an address to a node requesting an address. 3. The distributed computer system of claim 2, wherein the protocol server is adapted to liberate the permanently associated address when the management layer of the current monitor node detects as down said node. 4. 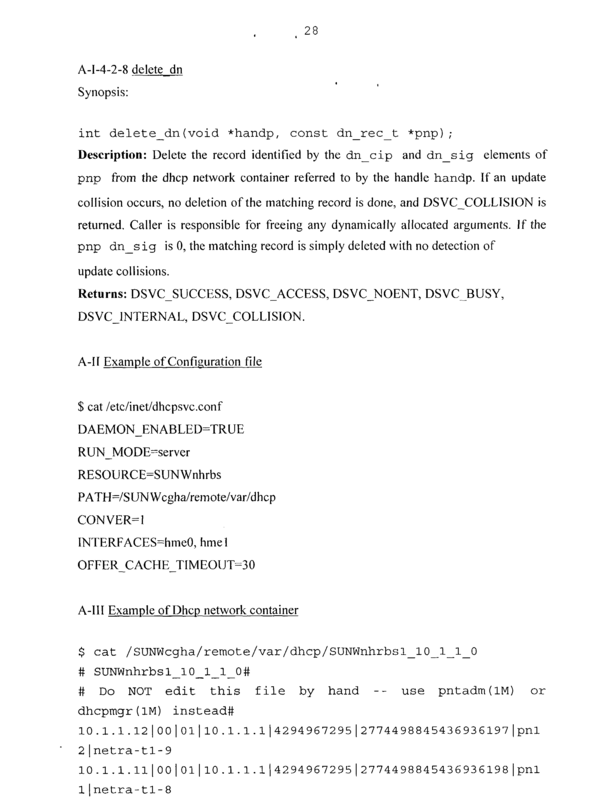 The distributed computer system of claim 3, wherein the protocol server of the current monitor node is further adapted to designate an association of address-identifier of a node in the list to permit manual change of the identifier in case of change of the identifier of said node. 5. The distributed computer system of claim 4, wherein the protocol server of the current monitor node is adapted to associate a first address to a first link of a node and to associate a second address to a second link of this node, first and second addresses comprising four octet having three identical octet to designate the same node, the fourth octet being adapted to designate the first and second links. 6. The distributed computer system of claim 5, wherein the protocol server of the current monitor node is adapted to associate a third address to a node comprising four octet with three identical octet to first and second addresses, said third address indicating first and second addresses are used in a redundant manner. 7. 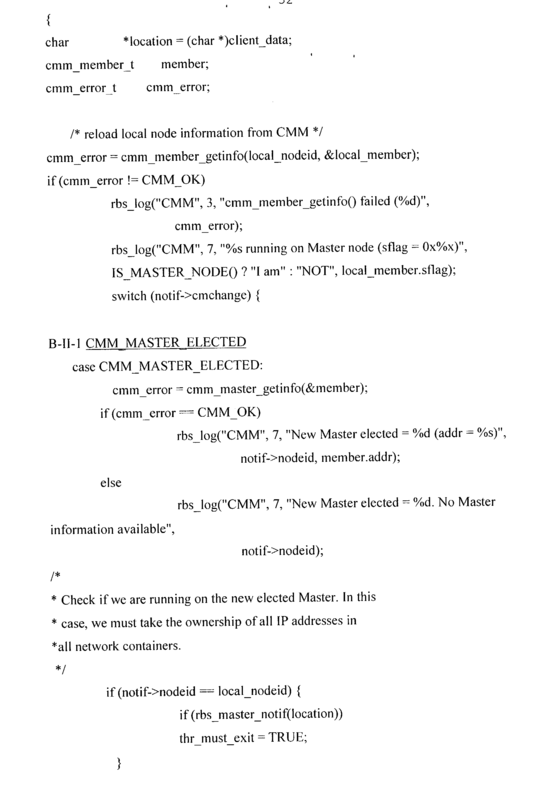 The distributed computer system of claim 1, wherein the protocol server is adapted to cooperate with an internal cache in order to store the address provided to the requesting node and in order to supply this address responsive to a request of the same requesting node after a re-boot. 8. 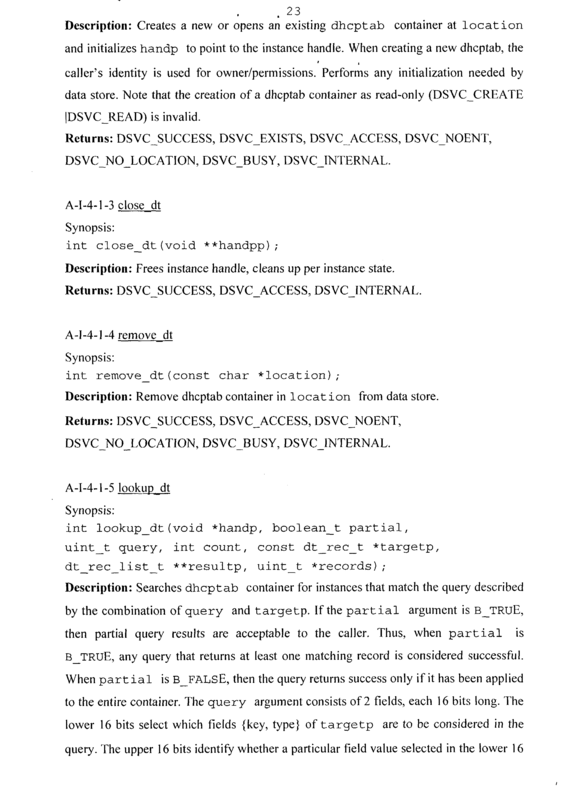 The distributed computer system of claim 1, wherein the protocol server comprises an address management module adapted to provide the address services as claimed in the preceding claims. 9. The distributed computer system of claim 1, wherein the protocol server is capable to be configured by a configuration file tool so as to use the address management module. d. repeating steps a. to step c.
11. 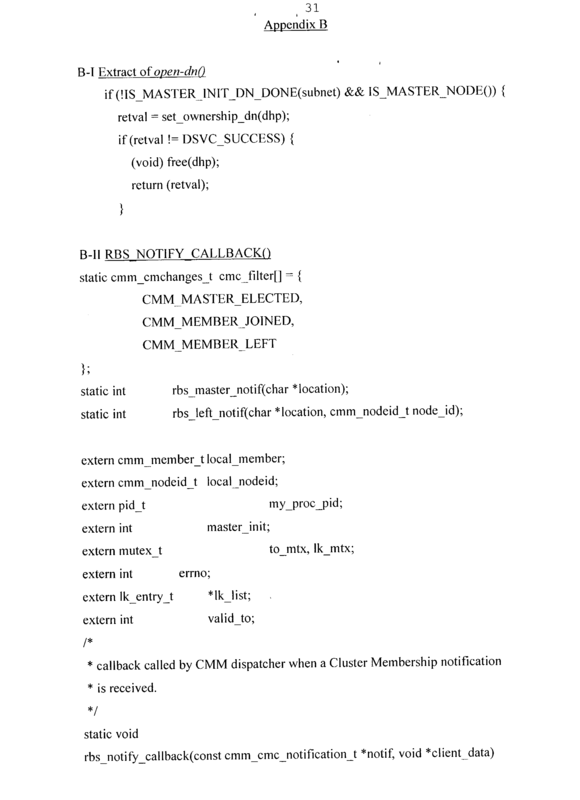 The method of claim 10, wherein step c. comprises permanently associating an address to a node requesting an address. 12. The method of claim 11, wherein step c. comprises liberating this address when the current monitor node detects as down said node. 13. 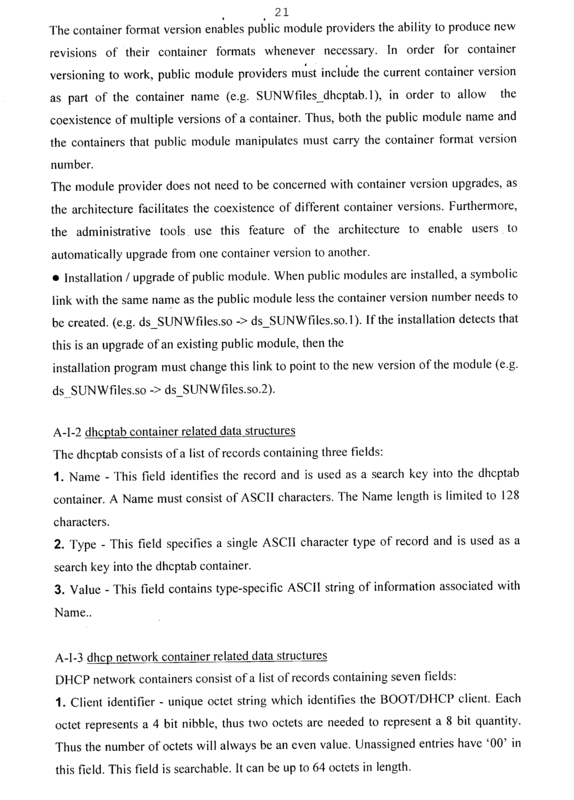 The method of claim 12, wherein step c. further comprises designating an association of address-identifier of a node in the list to permit manual change of the identifier in case of change of the identifier of said node. 14. The method of claim 13, wherein step c. further comprises associating a first address to a first link of a node and associating a second address to a second link of this node, first and second addresses comprising four octet having three identical octet to designate the same node, the fourth octet being adapted to designate the first and second links. 15. 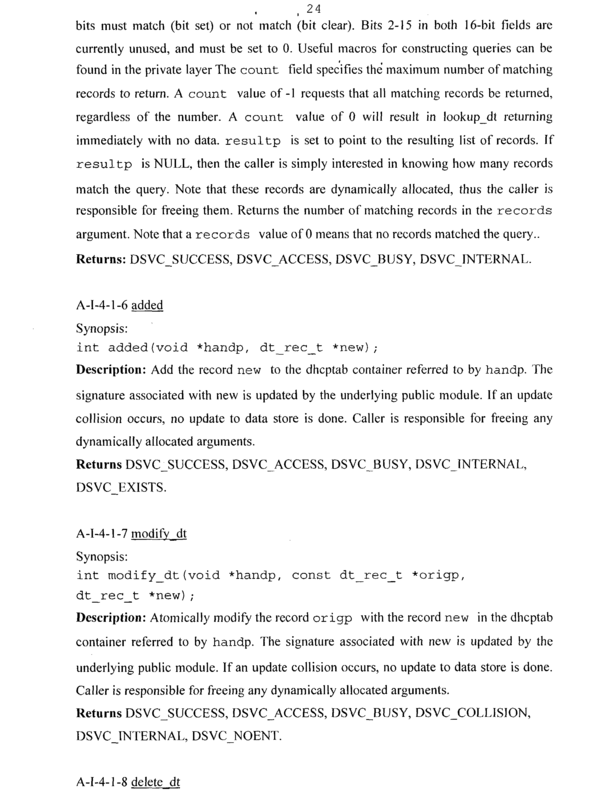 The method of claim 14, wherein step c. comprises associating a third address to a node comprising four octet with three identical octet to first and second addresses, said third address indicating first and second addresses are used in a redundant manner. 16. The method of claim 1, wherein step c. comprises storing the address provided to the requesting node and supplying this address responsive to a request of the same requesting node after a re-boot. 17. The method of claim 1, wherein the current monitor node is the master node of the group of nodes.